As models walked down the runway at the recently concluded Lakme Fashion Week in Mumbai, wearing the finest organic Ryndia silk from Meghalaya as part of the Northeast Mojo show, heads turned in awe. To many, it was a bold statement celebrating the efforts of many to keep alive the tradition of weaving despite the onslaught of fast fashion. For Daniel Syiem, a designer from Meghalaya, the ‘ahimsa silk’, extracted from cocoons without killing the silkworm, is his way of redefining fashion. 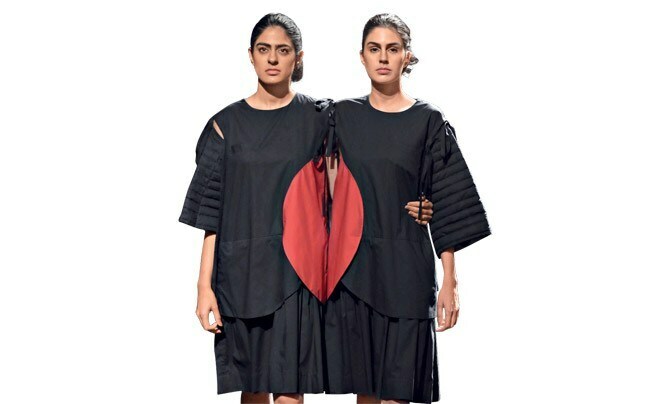 Syiem and Delhi-based Jenjum Gadi, who showcased a collection made with hand-woven fabric from Nagaland, are among the new crop of designers giving Indian fashion a new direction in terms of identity. While Padmaja Krishnan, who is from Bihar and works with organic cotton, pushed the boundaries with her minimalist designs to create ‘unpretentious simplicity’, ace designer Manish Malhotra unveiled the Inaya collection, made from the natural fibre Merino wool. His inspiration was the traditional motifs of Kashmir with intricate tilla and zari embroidery-an ode to the dying crafts of the region. The textile industry is the biggest polluter in the world, after oil. So, as sustainability becomes a global movement in the world of fashion, with millennials looking to reduce their carbon footprint, designers are focusing on sustainable fabrics. As more and more buyers think about what becomes of clothing that is not bought, or that goes out of style, designers are offering recycling and upcycling as solutions. They are also returning to their roots and rediscovering traditional ways of weaving to help sustain rural economies. As the fashion week showed, sustainability has created its own spin-off trends. Delhi-based designer Akshat Bansal, who made his debut last season, showcased a collection made out of ocean waste recycled as fabric-aptly titled Mourning of the Marine Life. Bansal, who is a graduate from London’s Central Saint Martins and has been an apprentice at Savile Row, presented a deconstructed mix of linen, delicate Japanese lace and sustainable fabrics made entirely from regenerated marine plastic waste. “Through this collection, I seek to shift our collective focus to the plight of oceans. It is the agonising moment of our progress in science and yet a social regress that my collection encapsulates,” says Bansal. The larger sustainability trend has included designers such as Rimzim Dadu, who in the past decade has consistently worked with wires, metals and plastic waste to make her garments. “Indian audiences are now more accepting of new ideas and experimental fashion than ever,” says Dadu, who calls her studio a ‘lab’. Even jewellery is no more the same, with brand Greytone using cement in its designs. Reflective of a larger global movement, Adidas collaborated with Parley for the Oceans in 2015 to create a trainer made of yarns and filaments recycled from ocean waste. In 2016, WGSN, a top global trends forecasting agency, announced the death of authenticity and a move towards being ‘real’. It meant presenting “our lives, unfiltered” as consumers move towards homemade and artisan designs that celebrate imperfections and uniqueness. Dubal says slow fashion always appealed to him as the craft is a living tradition in India. Since 2003, when he first presented his collection-made from Eri silk-at the Lakme Fashion Week and was roped in by a trends store in Paris, Dubal has been consistently associated with ground-breaking work in the Indian fashion industry. Manipuri designer Richana Khumanthem’s label Khumanthem, which started in 2014, was a presentation of Wangkhei Phee handloom textiles, created by the Meitei community on a shuttle loom. Khumanthem works with weavers from her region, but the initial days were challenging. “In our region, handloom weaving is more like a hobby than an industry. A transformation is called for,” she says. Designer Sanjukta Dutta has created ensembles from the traditional Mekhela chador of Assam by contemporising them into interesting silhouettes. Her collection at the Lakme Fashion Week was widely lauded. Then there was Padma Raj Keshri from Ladakh whose collection, Looms of Ladakh, was created as a sportswear line at the Wool Runway for Woolmark India a few seasons ago. His latest collection was inspired by the organic modernity of the region. When Soham Dave, an Ahmedabad-based designer who has sworn off electricity and is a staunch believer in sustainable fashion, walked the ramp with Raziaben Mehboobbhai Pinjara and Rekhaben Solanki, two physically challenged women from Dholka in Gujarat, as part of the Usha Silai project show, the audience gave a standing ovation. Raziaben walked slowly on her prosthetic leg. After training with Usha, she opened her own sewing school and earns up to Rs 6,000 a month. With a mentally challenged husband and two children to take care of, Rekhaben’s life has been an uphill battle. But after training with Usha, she is able to run her household. Not just an innovative fashion concept, the Usha Silai show was also the curtain-raiser for sustainable fashion label Usha Silai, launched in collaboration with IMG Reliance. The initiative was tagged as #ReimagineFashion. Perhaps, initiatives like these can give fashion a new meaning and life. Kochi-based designer Sreejith Jeevan, who owns the label Rouka, was part of the show. The 12 women he trained over six months in the Puducherry cluster formed a pretty picture on the ramp-wearing customary flowers in their hair and walking with confidence to face the cameras. Maybe, this is the way to make fashion weeks more relevant and more than just an event. “We believe in clothes made with love,” says Jeevan. “A happy product is what we know will always be in trend. We love macro trends over micro trends. Sometimes, I feel the world has shrunk and we follow the international trends blindly.” The designer feels “timelessness” is the most sought-after Indian trend now. “We’re embracing Indianness in a monochrome way. It’s interesting, but I hope we don’t overdo it.” Jeevan says the Usha Silai project questions the process of garment manufacturing. “We all get comfortable about a certain way of doing things even though it may not be the best way. Such projects question these things. It’s fashion alone that can afford to create this kind of change,” he says. The world over, designers are trying to tell emotive stories through their collections. A case in point is Sumiran Kabir Sharma, who called his collection for the Lakme Fashion Week Janaza. Working with colours purple and black, Sharma highlighted the baggage of human existence, such as gender and class. Given his own tryst with gender and identity, the designer works with narratives to create his collections. Last season, he worked with the narrative of the women warriors of Sonagachi, the red light district in Kolkata. Such narratives are increasingly becoming commonplace-designers Monica Shah and Karishma Swali found their inspiration in the mountain god Niyam Raja from the Niyamgiri hills in Odisha and used floral and jungle motifs as a tribute to the local legend. Designers are also increasingly looking to art and artists to find inspiration. The label Lovebirds presented the collection, Born of Fire, in collaboration with Gurugram-based performance artist Princess Pea, self-questioning being the theme. In 2015, fashion label Pero had collaborated with the artist to create a line of Princess Pea dolls dressed in Pero outfits. The trend has only become stronger with time. Like designer Padmaja Krishnan, who named her collection at the Lakme week as Afternoon, drawing inspiration from the radical works of artist Nasreen Mohamedi. And then there were the Tetseo Sisters from Nagaland, devoted to art, culture and folk music from the state, who performed at the end of the Northeast Mojo show wearing traditional outfits. What better celebration of sustainability as the margins move towards the mainstream. Next Post:Google Home Mini vs Amazon Echo Dot: Which is the cheapest smart speaker you should buy?